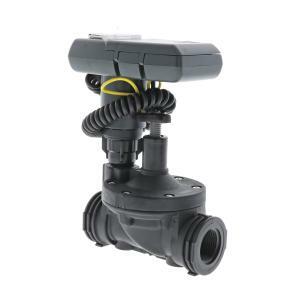 The solar powered ECO1™ILV is an advanced single station irrigation controller mounted on a 3/4" inline valve with DC solenoid. Easy to use with drip irrigation or sprinkler systems. The patented, time-tested internal photovoltaic module and microelectronic energy management system is energized by ambient (solar) light. Ambient light allows this controller to operate anytime, anywhere, and in any weather. Great features including five start times per day, durations of up to 5 hours and 59 minutes, Manual Run, Monthly Budget, Rain Off with restart in up to 99 days, System Off and Irrigation Off for any month of the year, make this a versatile option for any single zone irrigation system.